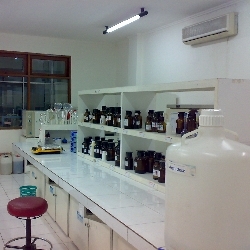 NWC laboratory bench in Jakarta. Increasingly, our customers are recognizing the importance of analysis for all types of water. For water and wastewater treatment, a thorough laboratory analysis is the first step in characterizing the water properties of interest. An early analysis can save considerable expense by helping to determine a customized design according to the specific conditions of each project. Nusantara Water Centre has an extensive dedicated environmental laboratory that provides accurate, efficient and fast analytical services for research and advisory purposes. NWC's standard analytic practices follow guidelines set forth in ISO 17025:2005. In our microbiological laboratory we are able to identify a wide spectrum of bacteria and other microorganisms. We have developed Super Growth Bacteria (SGB) suitable for dysfunctional wastewater treatment plants. The analytical laboratory provides a broad range of analysis of water, wastewater and river water in compliance with the requirements of the Indonesian Government. 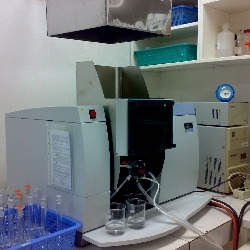 Atomic Absorption Spectrometry (AAS) is employed for heavy metal analysis, while VIS-Spectrophotometry is used for identification of different anions and cations. Our most important principle is to ensure correct results. To this end, we have installed a quality assurance system with close supervision. Our personnel are highly trained and experienced. Our skill is the unique combination of analytical chemistry, biology and physics in a team which does not merely read data but also provides interpretation of the data obtained. Our laboratory has been accredited by the national authority since 1997.